I have no problems running winbuilder 77 rc2 on win7.7100 x64. 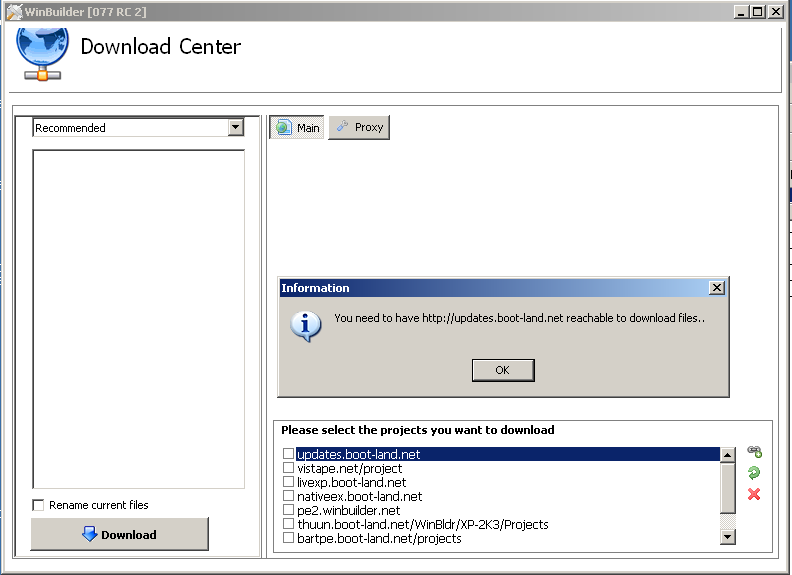 I can download files with winbuilder. Are you using a proxy? Cannot use RC2 at all. Had to go back to using 076. I am sure psc is listening. However until you can work out what is different on your PC that is stopping it working then it may be difficult as it is working for many people. Maybe it does not like the UK. a dual boot system, 2 hard drives. 2nd hard drive has Vista X86 which is where ALL winbuilder work is done. There is nothing on the drive other than nero burning rom, winbuilder program/tools and VMware player. Eset smart security which is not blocking anything, I get the same error message with Eset turned off and disabled. I also am using win7 x64 and eset antivirus. 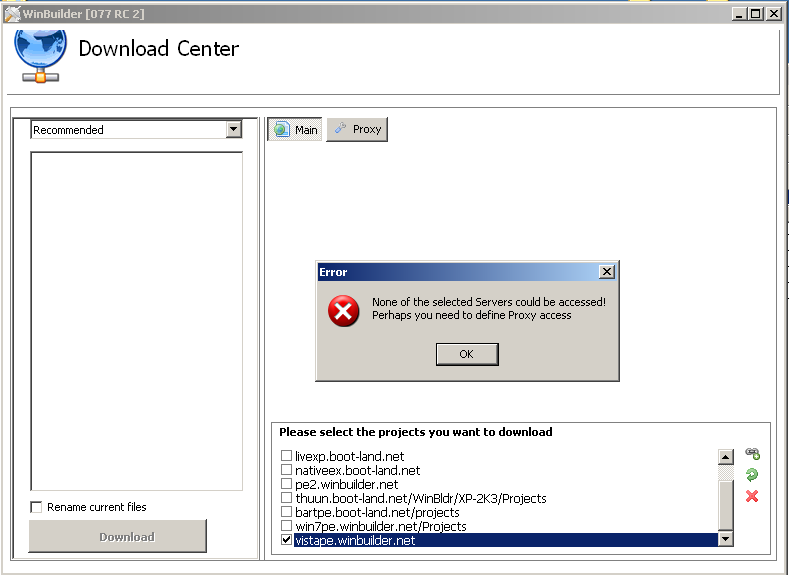 I have no problems downloading files with winbuilder 77rc2. Did you try going to the Tools / Options tab. Try tweaking some of the Network Support Options. 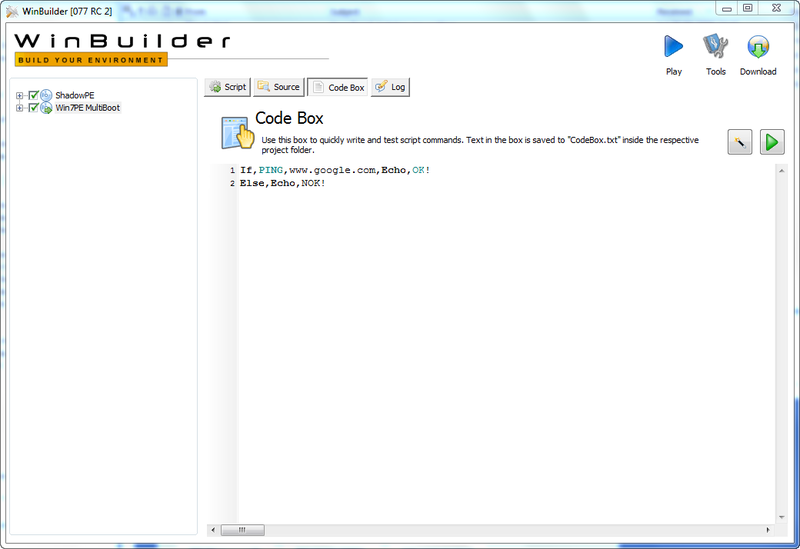 I don't use winbuilder on the X64 drive or windows 7. Tried this, but cannot see where it is Echoing the OK or NOK too? as it doesn't show in log after running script in codebox? But you also should see 'ping got answer' or 'ping got no answer' in the log. no i or cross, and no "ping got answer" or "ping got no answer" either in log?!?!?!? Something is different with your local installation. 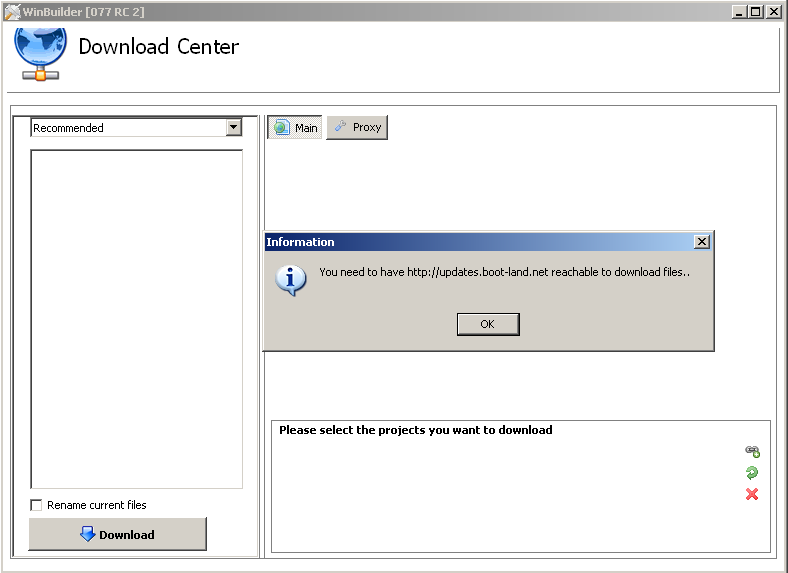 Maybe you download WB 077 RC2 into a fresh directory and try again. EDIT: I tried on Win7 RC1 64 bit German. Log is the same like the above picture. I've been a bit foolish not to see that. Your CodeBox snippet cannot run, because it is not in a [process] section. Script has been sucessfully processed! The difference is that M$ Ping uses information and functionality of M$ Internet Explorer, while since WB 077 beta WinBuilder uses Indy functions independent from IE. I'm currently not sure,l but even if you say thatb there is no proxy, I#m in doubt whether there are some M$ firewall activities. e.g. www.boot-land.net, livexp.boot-land.net, vistape.winbuilder.net etc. Edited by dera, 08 August 2009 - 07:51 PM. MS firewall is an incoming only firewall by default. If that was the problem ping from the command line or a browser would not work. I presume the two guys having problems have proved IE and another browser like firefox work ok. 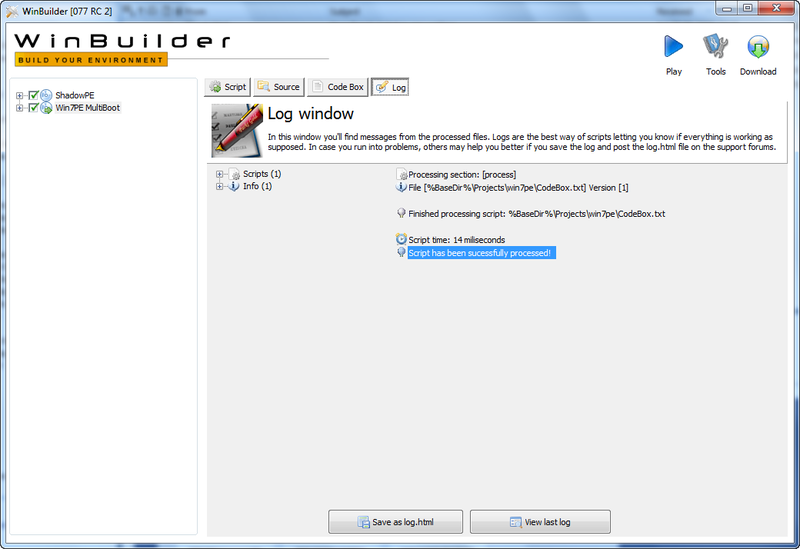 It seems to me there were far less problems with internet access with winbuilder when MS functionality was used. However maybe that's my imagination. I find that at work with my Laptop connected via the wired ethernet port Winbuilder 77 RC2 works fine and will download perfectly. But at home connected via Wireless it won't download, complaining it is not connected to the internet even if I disable the other interfaces).